I had the good fortune of meeting Walter Isaacson at a book signing for his Steve Jobs biography, and subsequently I caught him discussing his latest book, The Innovators. The book highlights a number of people involved with inventing the computer, Internet, and other considerable innovations. The interview was filled with numerous interesting tidbits. 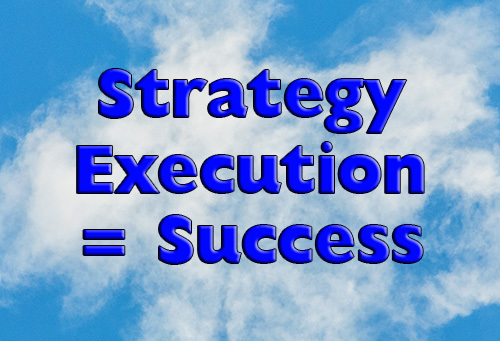 As a lover of the art of strategy execution, one thing Mr. Isaacson said really stuck with me, “vision without execution is hallucination.” This comment underscored the widely agreed upon notion that strategy execution is challenging to say the least! Statistics demonstrate, for a wide range of reasons, less than 20% of organizations successfully execute strategy. Intellectually, leaders know execution doesn’t just happen. It has to regularly be driven, managed, and measured. This begs the question, why is it so challenging. Looking at a variety of companies, regardless of the number of employees or industries serviced, lack of communication is one of the top reasons for failure. Although senior leadership may work very hard to create a strategy, the execution of that strategy ends up becoming only a very small focus of their time. It’s almost as if the strategy itself becomes its own isolated entity and fades as day-to-day operations get in the way. One of the greatest impacts senior leadership can have when driving strategy execution is to gain buy- in from individual managers across the company. The organization benefits when individual supervisors understand how they and their teams can directly impact executing strategy. “HOW” what each facet of the company does to bring the strategy to fruition is critical. Success rates climb when leadership both translates and incorporates strategy execution into everyone’s daily functions and activities. Clarity related to what employees can do everyday within their own job function to drive effective execution will improve results. Sustained change happens when concepts are made real for all employees and they fully understand “HOW” what they do impacts execution. Each person’s individual job and decisions impact the bottom line. There will always be something more urgent that comes up during daily operations. Avoid execution efforts from fading and leaving the process exclusively to others. Drive execution, be visible, share your own challenges and highlight progress. Where possible, avoid generalizations. Rather, be specific as it relates to individual job functions. Highlight details, underscore how small changes impact strategy execution. Don’t lose them among the big things. Approach efforts with purpose and a sense of urgency. Celebrate successes. Go beyond traditional methods of communication. Ensure messages are delivered in several different ways to reinforce and support everyone’s method of communication. Be a constant reminder that the organization is heading in a new direction. Share how movement will regularly be measured. Check for understanding. Too often departments are treated as silos. Bring people and units together to underscore that everyone is unified in working towards the same goal. Include all areas of the company in the execution process; you’d be hard pressed to find any branch within the firm that cannot support the execution of strategy. Speaking specifically of the staffing industry, when business development, managed solutions, and service teams pull together, progress improves exponentially! Avoid the trap of counting on the business development team alone to increase revenue. Sales relates to everyone’s job! Call to attention how the service delivery team impacts overall growth. If nothing else, service delivery can work closely with the business development team to create a more detailed picture of the client. Ask yourself, how well do your business development and service teams share insight and information? It’s no secret that when people feel their input is valued, a payoff becomes clear. Another example: is your financing department suddenly seeing changes within collections at a specific client? It’s critical to work with the service and sales teams to further understand what might be happening to cause such issues. Additional information may prove to be invaluable. Ensure department and field managers regularly engage with each other to ensure implementation and results are being measured. Make appropriate changes were they’re needed. Recognize and share successes. Promote information flow across the whole organization. Create a transparent environment sharing efforts, results and progress. Provide a framework which can support the constant reminder that implementing strategy is an essential part of work each day. View strategy execution as ongoing. Avoid the trap of allowing it to fade very much like a New Year’s resolution. Consistently integrate it into regular meetings and updates. Give it the rightful energy that is required for its success. Ensure you have advocates throughout the company. Regardless of position, uncover your hidden leaders, those employees that understand how to impact change. Take advantage of their ability to motivate and spread the message. Tie all actions back to the strategy, remind everyone that they are individually accountable for the team’s success. Weave it into regular business rather than something that’s brought up once in a while. Create an easily identifiable logo or theme which appears on all internal communiques to help keep the team focused. Embrace the inevitable emotional side of change as well. Resistance, roadblocks and conflict are natural. Identify and deal with them, head on. Underscore how changes will add value. 8. Align recognition programs to the successful execution of the strategy. Make sure your recognition programs bring value to your team. Understand who will do what by when. Measure results. Follow up to ensure expected results are being realized. Recognize and share the progress. Understand how you will gain the data to measure the outcome of your efforts. Be able to monitor progress, communicate movement, reinforce accountability, to serve as a basis for reward. Review progress against key performance indicators in real time. If actions are not moving the organization closer to the desire end state, make necessary adjustments quickly. Please share what has worked for you and your organization. Carla Perrotta is an operating leader who was educated in sales and business development. She has extensive P&L experience, and has grown and expanded multiple firms. Carla enjoys working with companies in growth mode, turnarounds and start-ups. Because of her years in the staffing and service industries she has a keen focus on its greatest asset, people.